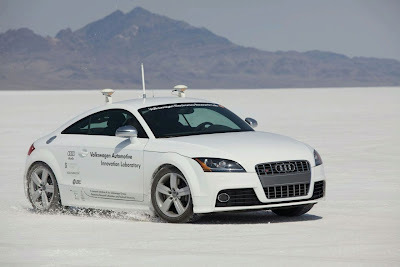 Named "Shelley," Audi and Standford University have teamed up to create a completely autonomous Audi TTS to compete in the Pikes Peak International Hill Climb. Using advanced drive-by-wire technology, Shelley uses algorithms developed by Stanford University and Sun Microsystems working in connection with "Applanix POS LV420 GPS and the Inertial Measurement Unit" to actually navigate competitively in the hill climb without a driver." How cool is that? Considering we're just car guys, we'll leave the techno-babble for the pros, check out the press release below for hardware and software details. But before you do that, check out this video, showing "Shelley" in action. The Audi Pikes Peak TTS is nicknamed "Shelley" by the Stanford DDL after Michele Mouton, arguably the most successful female rally driver to date who played a significant part in Audi's racing history. To collaborate with Stanford to build an autonomous vehicle capable of completing the Pikes Peak International Hill Climb in a reasonable time using rally driving techniques. Convert a vehicle to drive by wire, develop a safety architecture to ensure a reliable autonomous drive with no safety driver, and implement Stanford's control algorithms on a system jointly developed with Sun Microsystems. Develop robust control algorithms that enable the vehicle to drive at the limits of handling on a variety of surfaces, and lets it complete the Pikes Peak course. Specify a hardware platform that can run Stanford's real time algorithms and develop a framework that enables Real Time Java to the vehicle CAN system. Weight incl. sensor: ~ 1470kg. Steering: Modified "APA-BS" (Axially Parallel Actuation-Braun-Schweig), a new production electric power steering system with direct by-wire control through custom ERL Electronics. Throttle: Electronics from VW ERL reproduce signals to emulate a driver pressing on the throttle. Brakes: Active brake booster from Continental with by-wire control through ERL Electronics. Gear: Modification of signals exchanged between transmission and gear shifter using custom ERL electronics on production hardware. Parking brake: Use of stock electric parking brake from VW Passat through a custom ERL electronic interface utilized on Junior. In addition to multiple redundant systems for vehicle control, and emergency shutdown the Pikes Peak TTS has a Solaris based system running a Java RTS system monitor that can perform a vehicle shutdown if it determines conditions have become unsafe. As a backup solution, the vehicle includes a telemetry system that can transmit all vehicle parameters to a receiving station up to 20 miles away which can also shut down the vehicle remotely, or order the safety systems to engage and bring the car to a controlled stop. The Pikes Peak TTS utilizes an Applanix POS LV420 GPS and Inertial Measurement Unit to measure its position. Two independent systems are being used in the Pikes Peak TTS, the initial controller development is being done on an XPC target using Matlab and Simulink which are the standard research tools from Stanford's DDL. The final vehicle controls are being run on ruggedized custom built solutions running a Core2Duo CPU and Solaris operating system that is being developed in collaboration with Sun Microsystems. The Stanford University Dynamics Design Lab is developing cutting edge control algorithms that look to optimize the ability to control the vehicle under the most demanding circumstances. As these algorithms are finalized they will be merged into a new framework being developed at the ERL based that shares many components with other ERL Autonomous driving projects.